The National Flood Insurance program, administered through FEMA which is in turn part of the Department of Homeland Security, is currently how the vast majority of Long Islanders and people all around the country buy their flood insurance when needed. The idea of the program was that because flood is catastrophic in nature, meaning that it can affect large numbers of people at the same time, that only the taxing power of the federal government was enough to make sure that when the time came to pay huge claims, the money would be there. The problem is that the rates being charged in the program are not nearly enough to pay the claims, so additional monies have had to be put in over the years by Congress, and those funds basically come out of taxes paid be everybody, not just those in the flood hazard areas. There are some social arguments back and forth about whether that’s right or wrong, but after Katrina, it was decided that the program needed to be revised to be ‘actuarially sound’, meaning that it would collect enough premium dollars to pay the claims, without resorting to general tax revenues or other bailouts. 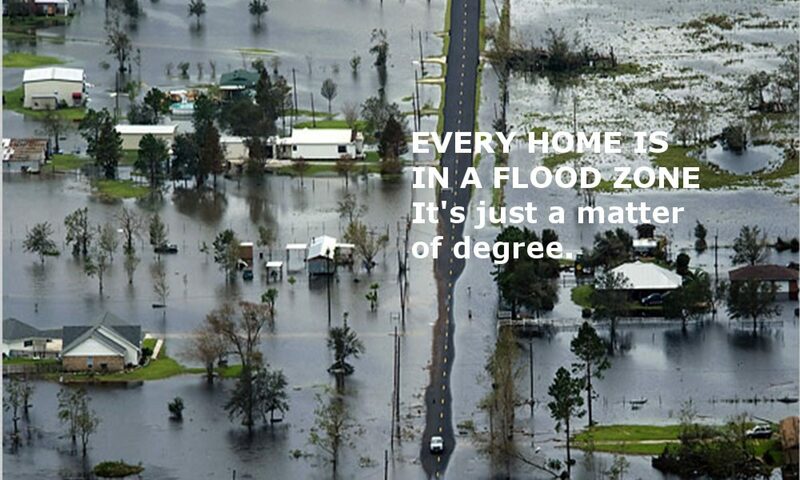 The difference is many billions of dollars, and the answer they have come up with is to include more people in the flood hazard areas and also to increase rates. But since a couple of the people whose homes were destroyed in Katrina happened to be influential members of Congress, they are not looking to stop there. In trying to judge who was responsible to pay the claims of Katrina, there was a lot of finger-pointing on the part of insurance companies who denied some claims that they felt should have been paid under flood coverage. However since many of the affected residents had been told that the work of the Army Corps of Engineers, in building the levee system, would protect them from flood, they did not carry flood insurance and so were left with no way to rebuild. What is being proposed is to move windstorm coverage from the private homeowners insurance industry to the government-backed flood insurance program, and price it accordingly. Interestingly, this has the insurance industry up in arms. Although as we know here on Long Island, and particularly as you get farther out on the South Shore of Suffolk County, many insurance companies are shying away from providing policies at all because of the windstorm exposure. Now this sets up an interesting position for the insurance carriers. On the one hand, they are arguing that wind insurance should NOT be taken out of their hands and put into the Government hands. In general, a founding principle of our country was private ownership, and that the Government should not set itself up as a competitor to private industry. But there are many cases (Medicare, Workers Comp…) where private industry was not up to the task and the government stepped in. To me, it seems simple enough – if covering losses for hurricanes is a money-losing proposition for insurance companies (which one would have to think it must be if they won’t write more coverage) then why would they care if the government took it over? And virtually any argument that could be made for or against the government covering windstorm could be easily turned into the same argument for flood insurance. So which is it? The coverage is too risky and they don’t want it, or it’s profitable and should be left in private hands? The answers being given by the industry suggest they are trying to play both sides of the fence. As for me as an agent, I have to say it doesn’t really matter. I sell both the government flood insurance as well as home insurance for all kinds of waterfront property. Our job is to deliver, explain, and service the product. So I have no great stake in the outcome here, but I know a snow job when I see one.